The Assassin’s Creed series has evolved gradually from one annual game to the next, but the upcoming Origins looks set to be its biggest leap forward yet. The likes of Assassin’s Creed: Black Flag and Assassin’s Creed: Syndicate may have introduced bold new features (vast seafaring, grappling hooks etc. ), yet the latter’s underwhelming sales prompted Ubisoft to adjust the cycle of yearly releases and create something revolutionary. As a result, Assassin’s Creed Origins has received more development time, and may well give the franchise the revitalisation it needs. The shift to Ancient Egypt as a setting and the plot’s chronicling the Assassins’ origins are fantastic ideas, but what else is there to be excited about? 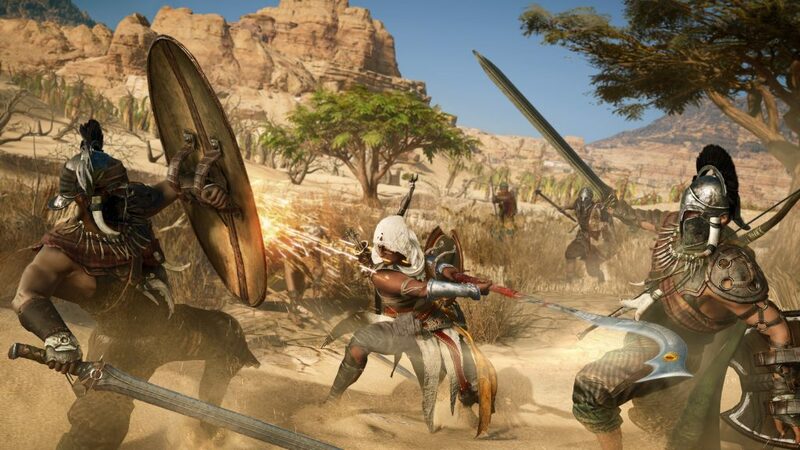 Assassin’s Creed Origins will introduce an overhauled combat system, based more on dodging and blocking than simply lashing out at enemies. The type of weapon you’re wielding will affect your attacks, with both the tool’s speed and size taken into account, while enemies’ movements will be equally affected. You’ll be able to choose from ranged and close-combat weapons, with bows, spears, swords, and plenty of others available. You’ll gradually get used to different weapons’ strengths and weaknesses, and your shield will be integral to surviving. Assassin’s Creed Origins’ combat could well be the series’ best so far, providing a more realistic, strategic experience. Eagle Vision has been a staple of the Assassin’s Creed games, but that’s all changed in Origins. Your new eagle pet, Senu, can actually be controlled by your own fair hands. You’ll be able to take her out for a fly around the game world, and scout locations in far more depth than before. Your range of movement isn’t limited either – you can send Senu to explore as far and wide as you like, no matter how far she strays from Bayek. You’ll be able to plan your movement through different areas, locating enemies and deciding how stealthy you need to be. 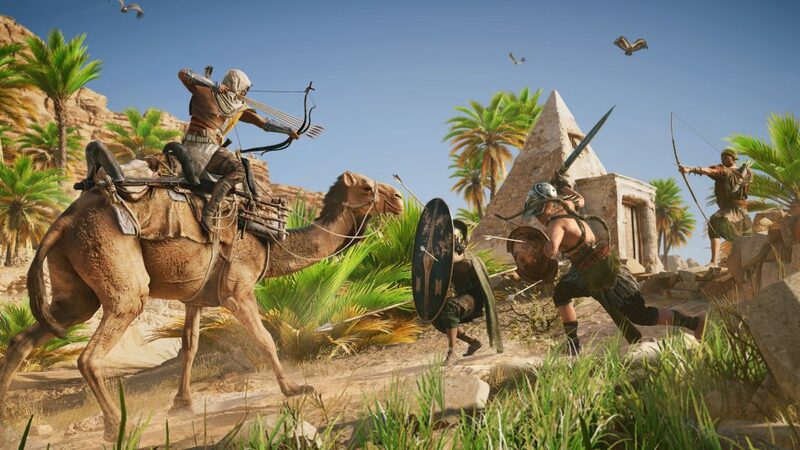 As Assassin’s Creed Origins is integrating numerous RPG elements into the game (including the ever-popular skill tree), crafting is another new touch. This grants you the freedom to boost your armour and weapons with a little bit of DIY, depending on the materials you have to hand. You’ll gather loot by exploring the world, though you can take gear to a professional blacksmith to be enhanced if you’re happier paying. As you upgrade through crafting, you’ll boost your stats (strength, etc.) to give yourself a better chance against tougher enemies. 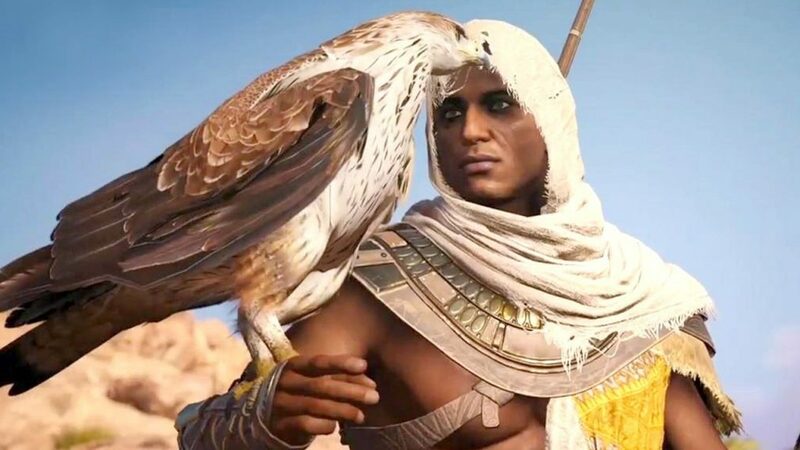 This is a nice way to inject more depth into the experience, and the physical changes in Bayek’s outfit will help to keep things fresh throughout the game. 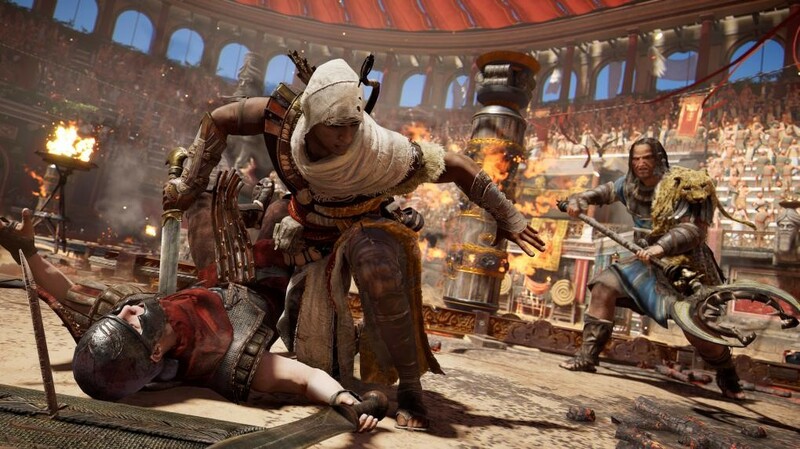 Assassin’s Creed Origins’ arena mode will pit you against waves of enemies in brutal gladiatorial combat. This is ideal for players who want to focus on the game’s fighting aspect for a while, and though this mode will debut in the story, you’ll be able to take part in brawls as a kind of mini-game. Facing countless enemies in the arena will earn you new equipment and weapons, giving you real incentive to play (beyond the fun of it). 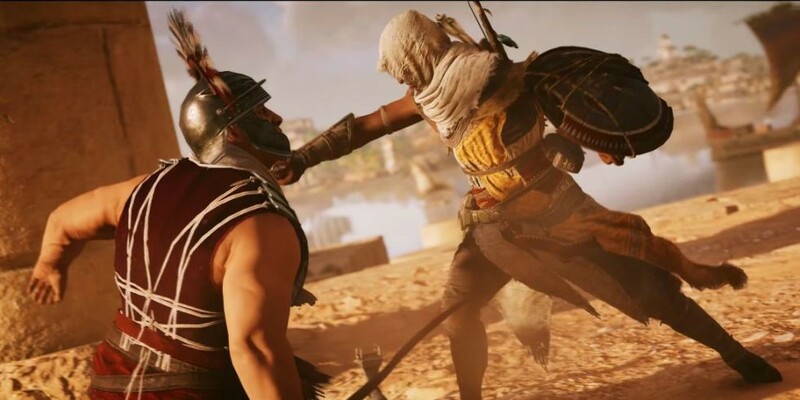 Once Bayek has defeated enough bad guys, he’ll encounter a boss character – kind of like having a traditional fighting game slipped in for free. Assassin’s Creed Origins allows you to tame wild animals of various kinds – and call on their help if needed. Crocodiles, lions, hippos, hyenas, and more can be turned to your side. This ability needs to be unlocked before you can use it, but you can be sure you’ll have a blast with it when you add it to your list of skills. This feature will be familiar to anyone who played Far Cry Primal, and it’s yet another touch that should make Assassin’s Creed Origins the deepest entry in the franchise so far. Assassin’s Creed Origins will feature expansive underwater environments, including deep ruins, shipwrecks, temples, tombs, and more. We’ve taken Assassins under the ocean before, but not on this scale. This makes the game’s world even bigger, and opens up more areas where you’ll find loot. 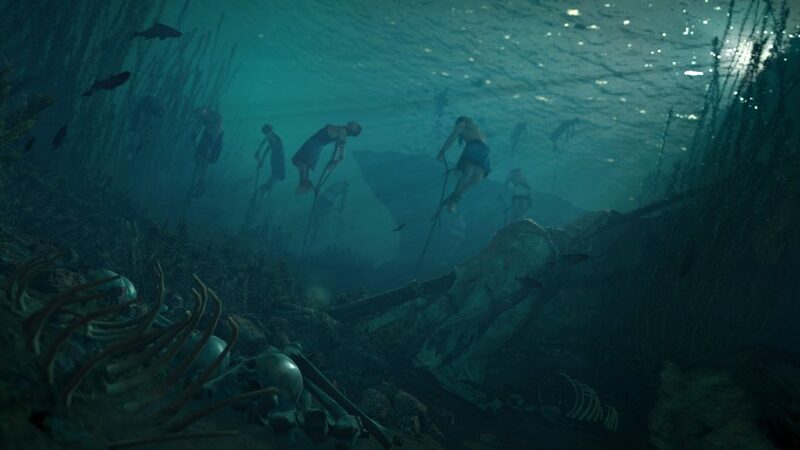 You’ll be free to explore underwater settings at your leisure, and given how gorgeous the visuals are, they’ll ooze atmosphere from every pixel. Going underwater will enable you to find shortcuts into forts too! 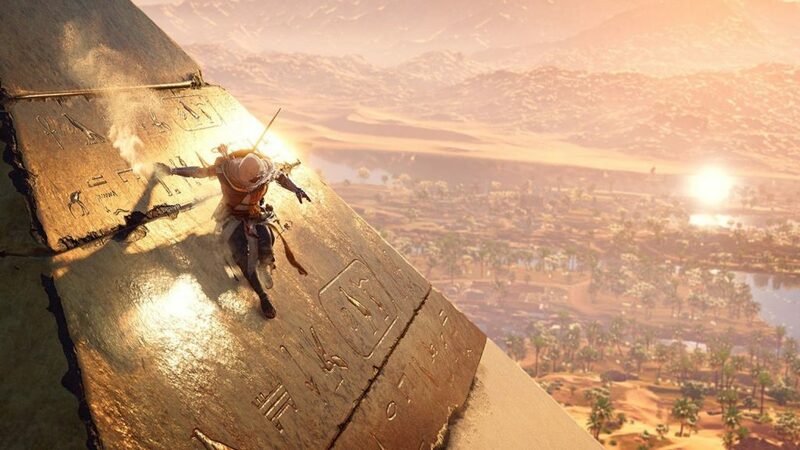 Assassin’s Creed Origins brings tomb-raiding back to the series for the first time in years, and Ubisoft has invested serious time into researching real tombs of Ancient Egypt. They’re aiming to bring as much authenticity to these environments as possible, and the tombs will play different roles in the game. Puzzles and challenges will feature throughout, bringing more to entering a tomb than simple exploration. It’ll be fantastic to step foot in these eerie spaces, and help to flesh the game’s world out even more. These exciting features are just part of the reason Assassin’s Creed Origins has so much potential – here’s hoping it lives up to its promise when it arrives next month! Assassin’s Creed Origins takes the series’ action to Ancient Egypt, and boasts some exciting new features. Which are you most looking forward to? Let us know!